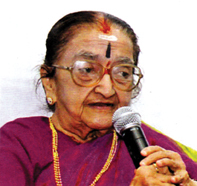 Rajalakshmi (Rajamma, to most) Parthasarathy is a woman with many talents. She has left her mark on journalism, theatre, social causes and restoration of temples, besides playing a major role in education. The school she started, Padma Seshadri Bala Bhavan (PSBB), has grown into a group of institutions of higher secondary education of high repute in Chennai today. Her life, however, goes beyond education, and her contribution to art and culture equals her promotion of the cause of education. In the field of arts, Rajalakshmi chose to bask in the shadow of her late husband Y.G. Parthasarathy, a passionate player in Tamil theatre, popularly known as YGP. Many know her, therefore, as Mrs. YGP without the least idea of her given name. She was the first woman journalist to enter the portals of The Hindu, “the staid and sedate newspaper”, as her biographer Lakshmi Devnath puts it in A Class Apart. She was just 25 when, as Rashmi, she provided comfort to anxious women in an ‘agony aunt’ column What Should I Do? in Sport & Pastime (1948 – 1967), a weekly of The Hindu. Donning another pseudonym, ‘Jalak’, she wrote in Tamil for Kumudam and as ‘Sumangali’ for Swadesamitran. Women’s Corner was her column providing a rational slant to women’s issues. She also wrote on fashion trends in Sport & Pastime. A compilation of her columns has been published as a book, Stree. “I was a rebel. I didn’t like old-fashioned ideas.” she says. In one of her columns, she wrote tips for career girls as early as 1950 when very few women were part of the workforce. In it, she cautioned the secretary to be firm with the ‘flirtatious boss’, advised the receptionist to be tactful and told the teacher ‘not to be frightened’. At the same time she asked the teacher not to be ‘carried away by your colleague’s charms’. She built impressive credentials as a journalist before moving on to other spheres of activity. Rajamma’s childhood was shaped by her mother Alamelu from whom she drew inspiration and imbibed a host of qualities, the most prominent being the ability to take control of any situation. She says, “My mother was broadminded, but an orthodox woman steeped in our culture.” Absorbed in books, Rajamma developed a sharp mind, and went on to become the first woman graduate in the family. Yechan Gunja Parthasarathy (YGP) entered her life by accident while she was in college. She was a source of solace and strength for Vaidehi, her close friend at college and YGP’s sister, who was undergoing problems as a result of her love marriage that had displeased her in-laws. An innocuous letter of gratitude from YGP kicked off what was to become a lifelong association. Not long afterwards, the book-loving introvert. Rajalakshmi, became the life partner of the witty and ebullient extrovert YGP. As a result of the association, she too became a connoisseur of the arts. Back from Delhi, YGP was acting at Suguna Vilasa Sabha (SVS) in 1948, where he spotted ‘Pattu’ (Padmanabhan) – a fellow actor and scriptwriter with a flair for comedy writing. They struck a close friendship. Recalling the time, Rajamma says, “He was not happy as there were few opportunities and SVS did not encourage theatre after some time.” Seeing the duo’s common passion for theatre, she suggested that they start a troupe on their own. Thus was born the Tamil theatre group United Amateur Artistes (UAA) in 1952. UAA was known for introducing English mixed with colloquial Tamil. It encouraged women actors to come on stage. Cut dialogues – stopping a dialogue mid-sentence countered by another – was another highlight of UAA’s plays. Critics slammed it, but audiences loved it. Every UAA script was vetted by Rajamma: YGP would never finalise one without her feedback. It Happened at Midnight was UAA’s first production. Yaman Emaandan, Never Say Die and Pavam Balaraman are some of the group’s social comedies, a genre that UAA had developed a niche for. 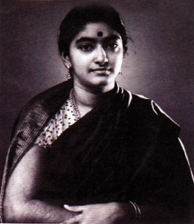 In the 1950s, Rajalakshmi also became the secretary of the Madras Natya Sangh, a branch of Bharatiya Natya Sangh. Initially, Rukmini Devi Arundale was the Sangh’s president. Later Dr. V. Raghavan, renowned Sanskrit scholar and Indologist, took over the reins. Natya Sangh was a national organisation with international prominence. It often invited popular productions in theatre and dance from abroad to perform in Madras. When Raghavan was President, the Sangh also adapted Sanskrit plays into English and Tamil. It was Rajamma who persuaded a fourth form student then, J. Jayalalithaa, to act in one of Natya Sangh’s plays, The Whole Truth. In a memorable ending to the play, the girl, after acting dead in the final scene, sprang up to take a bow along with the other actors. UAA faced multiple challenges such as no-shows without notice by actors, and occasional messing up of dialogues on stage. In time, UAA became a home for many prominent actors and Rajamma, as she was fondly called by the entire troupe, was the central figure around whom things revolved. The YGP house was like a second home to the UAA troupe. Apart from regulars like Sandhya (Jayalalithaa’s mother) and Vidyavati (her aunt), the troupe also featured Nagesh and Lakshmi, both of whom blazed the silver screen later. Veteran actor ARS (A.R. Srinivasan) and Cho Ramaswamy began stage acting with UAA. Cho more or less became part of the YGP household. In his memoirs written recently in Kumudam, he recalled his favourite activity – raiding her refrigerator for food – and his affectionate bond that still continues with Rajamma. Not only actors, but also scriptwriters like ‘Vietnam Veedu’ Sundaram, Venkat, Visu, Mouli – all made their debut at UAA. When Archibald McLeod, a famous director from the USA came for a year to train actors at the Natya Sangh, almost the entire troupe consisting of ARS, Jayalalithaa, Nagesh, Lakshmi, and others made use of the opportunity. One memorable play of the time was Tea House of the August Moon (John Patrick) in which Rajamma acted and spoke in Japanese. Rajamma had developed a flair for props, acting, story and dialogues. She was part of every story discussion as she had a strong sense of the story. Her twist to the story line in Kurukshetram, in which ARS was the lead actor, made the play a roaring hit. Her involvement did have some comical interludes. In his typical punchy satirical style with a touch of impishness, Cho says that all her suggestions were usually “rejected”. Scriptwriter ‘Vietnam Veedu’ Sundaram attributes whatever English he knows to Rajamma. Mouli says her suggestions had an underlying logic. Rajamma recalls, “YGP used to say, I was their best friend and worst critic. At times, I used to come up with absurd suggestions, which would make people laugh.” A drawback, she says, was her penchant for ‘mile-long’ titles, which would be shortened eventually. Popular actor and stage veteran Y.G. Mahendra, Rajamma’s elder son, who also made his stage debut at UAA, recalls a funny incident. YGP was in the habit of awarding Rs. 50 to the best title for a play whose script was ready. For one such play, an engrossing thriller by Mouli, Rajamma suggested the title Adi Mel Adi Vaithaal Ammiyum Nagarum. In a jest, YGP announced, “I will have to part with a part of my wealth for advertising this title in The Hindu”! That play, titled Padmavyuham became an all-time hit of UAA. Rajamma was a hard taskmaster. She would not hesitate to pull up Pattu for an ordinary script. When he produced one for Pettraaldhan Pillaya she told him, “You usually pour gold into your writing. In this script, you have just poured ink.” Needless to say Pattu converted that script into a masterpiece. Serious differences arose between YGP and Pattu and the duo had to part ways in 1962 much to YGP’s agony; he did not stage a play for two years. (Courtesy: Sruti).